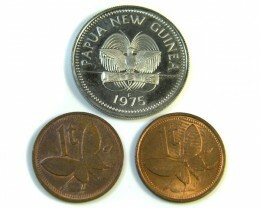 Sea shells were Papua New Guinea\‘s first currency but are no longer the currency of Papua New Guinea , as they were in some regions, sea shells were abolished as currency in 1933. 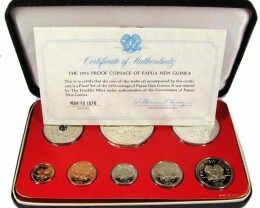 However, this heritage is still present in local customs; in some cultures, to get a bride, a groom must bring a certain number of golden-edged clam shells as a bride price. 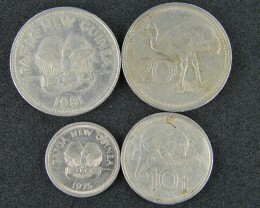 In other regions, bride price is paid in lengths of shell money, pigs, cassowaries or cash; elsewhere, bride price is unknown and it is brides who must pay dowry. 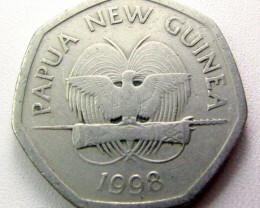 The island of New Guinea situated to the north of Australia was divided into two parts, the western part being a Dutch territory whilst the eastern was divided into administrative districts of Papua and New Guinea . 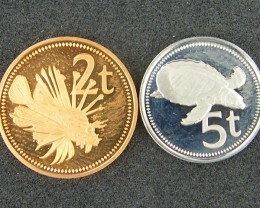 The Dutch section of the island uses the coinage of the mother country but has a special issue of its own notes. 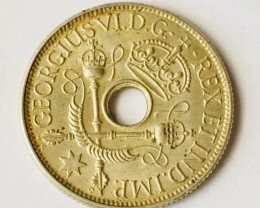 In 1884 the eastern section was divided between Britain and Germany , and later producing for its territory a series of coins consisting of gold ten and twenty marks, silver five, two, one and half marks and copper ten, two and one pfennigs. 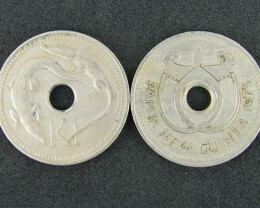 These were struck in Berlin and bear the denomination and date 1894 (1895 on the gold) within a wreath (a ring made of flowers) on the obverse and a bird of paradise on the reverse. 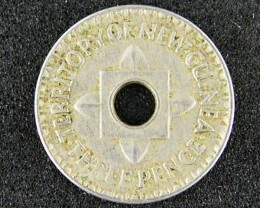 The German territory was occupied by Australian forces in September 1914 and in 1920 the Allies entrusted its administration to the Australian government. 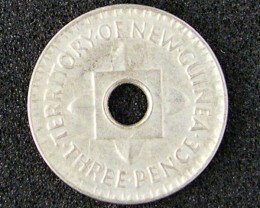 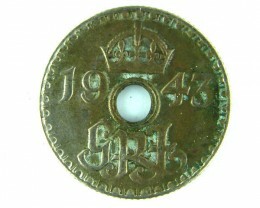 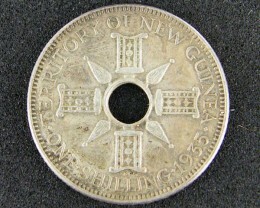 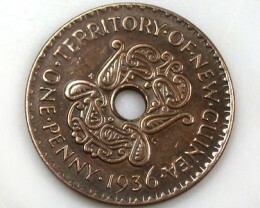 The first coins for Papua New Guinea appeared in 1929, the issue consisting only of pennies and halfpennies. 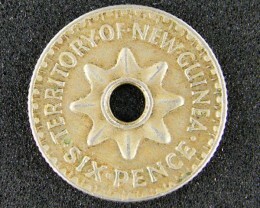 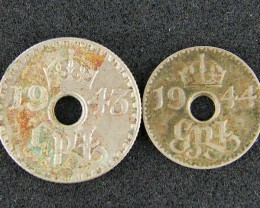 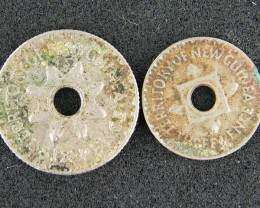 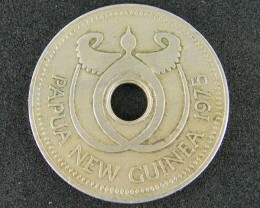 Struck in cupronickel, these first coins of Papua New Guinea have a centre hole and therefore do not have a portrait. 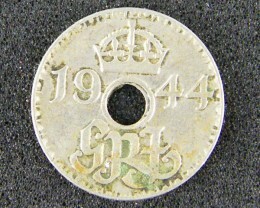 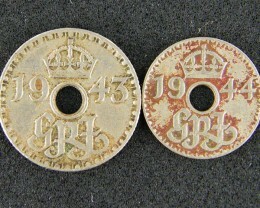 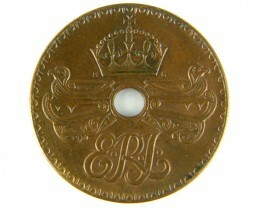 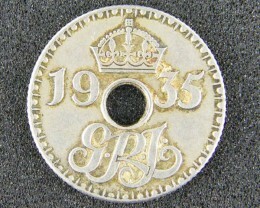 The next issue was made in 1935 when shillings, sixpences and threepences were struck: large quantities of pennies bearing the name of Edward VIII were produced the following year. 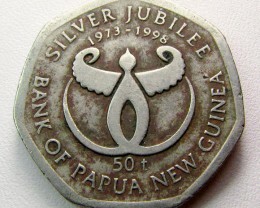 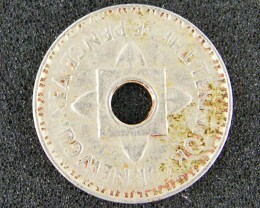 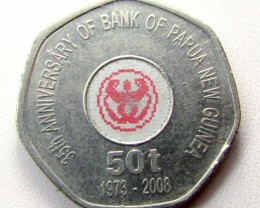 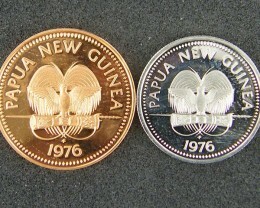 The first coins issued for Papua New Guinea were at its independence in 1975, and included a gold 100 kina. 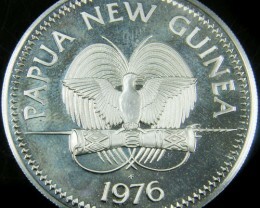 The obverse has a portrait of the Prime Minister Michael Somare. 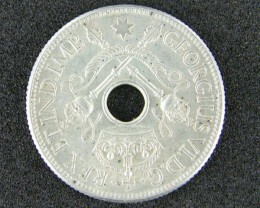 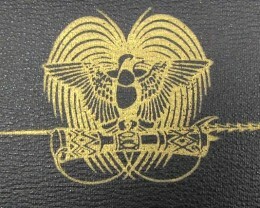 The reverse design reflects the national flag showing a soaring bird of paradise in the upper right, flying from right to left, and five stars to the lower left representing the 5 stars of the Southern Cross. 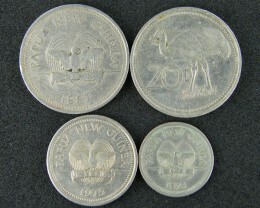 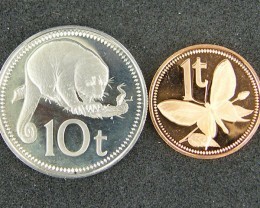 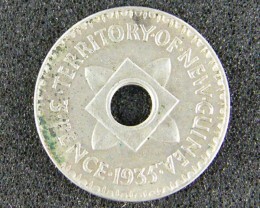 Coins of Papua New Guinea were mainly struck by the Franklin Mint. 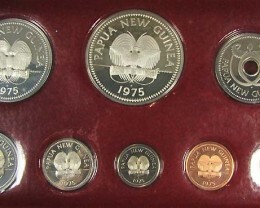 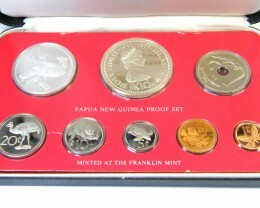 The Bank of Papua New Guineaissueda special, but, limited quantity of the1995 Commemorative un-circulated coin set, to mark Papua New Guinea \‘stwentieth anniversary of Political Independence on the sixteenth September, 1995 .